10 is another of my favorite hand's to be dealt. As always, we'll examine this hand assuming play in a multiple deck game where the dealer stands on soft 17. We are also assuming that the dealer does not have a natural blackjack. The big temptation with this hand is to double down, but the big question is in which instances is it actually correct to do so? Standing is definitely out of the question since no matter which card you draw you will not bust. Hitting has a positive return in each possible instance ranging from $0.02 to $0.29 for each dollar invested. The lowest of these are obvious when the dealer is showing 10 or A. When doubling down, the numbers change drastically. When the dealer is showing 2 through 9, the return per dollar ranges from $0.14 to $0.58. 10 and A both have a negative return. 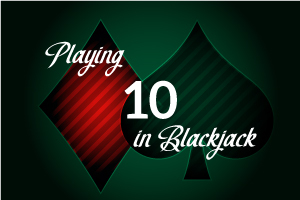 Because of this, when you have a 10, you will definitely want to double down if the dealer is showing 2 through 9, and only hit if a 10 or A is exposed.